reduce risk. improve asset life. NDT Services Group is a provider of condition monitoring services, offering a comprehensive range of solutions to industry. We pride ourselves on customer service for reliable plant and equipment which maximises profits and minimises downtime for clients. 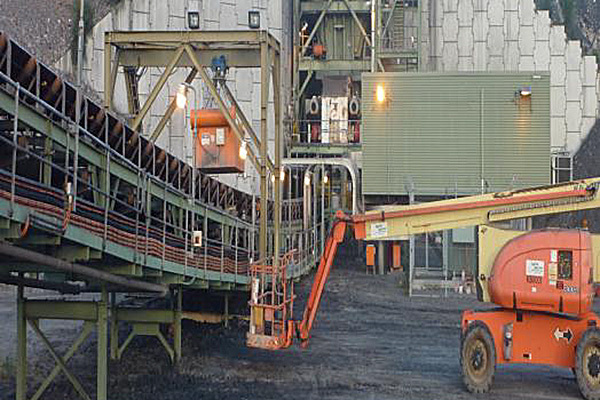 Our technicians are highly skilled and experienced across a wide range of industries from mining, utilities, infrastructure, processing, military and transport. 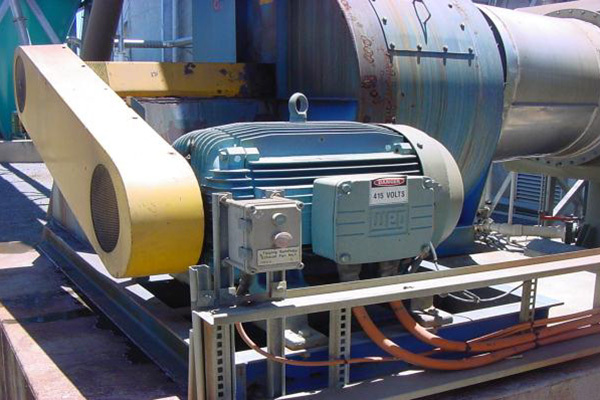 The condition monitoring technologies and services that we offer include: Vibration Analysis, Dynamic Balancing, Thermal Imaging, Oil Analysis, Laser Alignment, Electric Motor Testing, Ultrasonic Testing and Customer Support. Like to know more about our non-destructive testing and condition monitoring services and how we can help you? NDT Services Group offers a full range of diagnostic tests for your business critical low voltage, high voltage and DC motors. With the advances in computer aided and enhanced test equipment, electrical condition monitoring is now widely accepted as a beneficial technology to complement existing condition monitoring techniques such as vibration analysis, infra-red thermography scans and oil analysis. 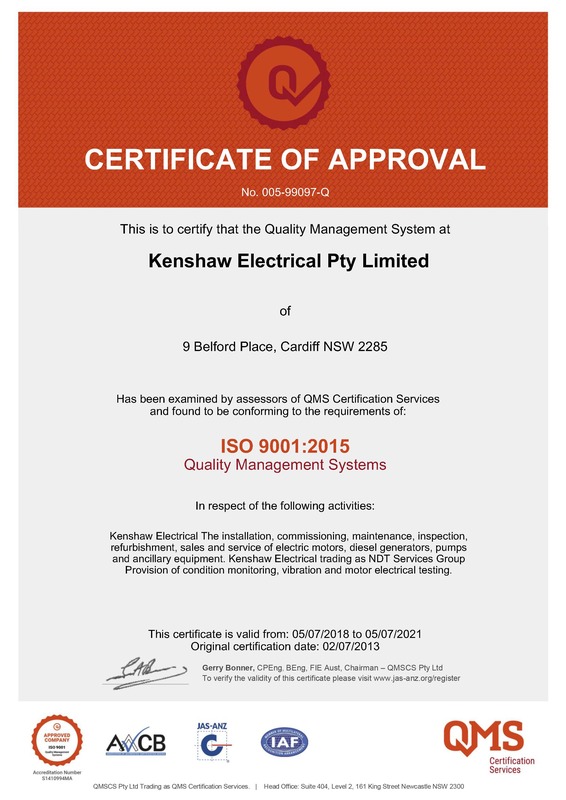 The use of a combination of proven and reliable condition monitoring techniques enables the motor or generator owner to confidently move from a time based maintenance regime to a condition based maintenance regime. A condition based maintenance program allows for the efficient use of site resources and offers significant financial benefits. 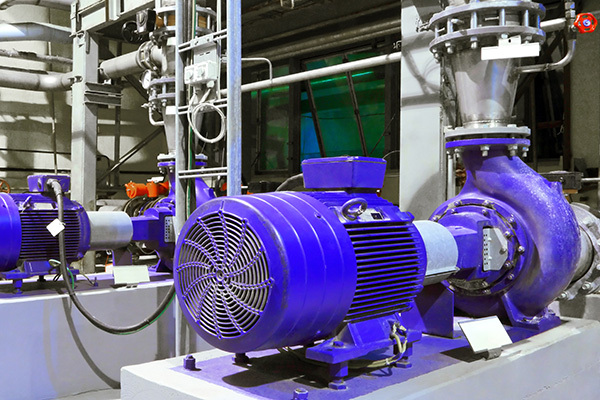 The use of a combination of proven and reliable condition monitoring techniques enables the motor or generator owner to confidently move from a time based maintenance regime to a condition based maintenance regime. A condition based maintenance program allows for the efficient use of site resources and offers significant financial benefits. No single test can identify all potential fault mechanisms. Reports with all test results, detailed analysis and recommendatioins are issued for every motor. Need help or advice regarding Motor Testing services? Oil analysis involves sampling and analysing oil for various properties and materials to monitor wear and contamination in an engine, transmission or hydraulic system. Sampling and analysing on a regular basis establishes a baseline of normal wear and can help indicate when abnormal wear or contamination is occurring. Oil analysis works like this. Oil that has been inside any moving mechanical apparatus for a period of time reflects the exact condition of that assembly. Oil is in contact with engine or mechanical components as wear metallic trace particles enter the oil. These particles are so small they remain in suspension. Many products of the combustion process also will become trapped in the circulating oil. The oil becomes a working history of the machine. 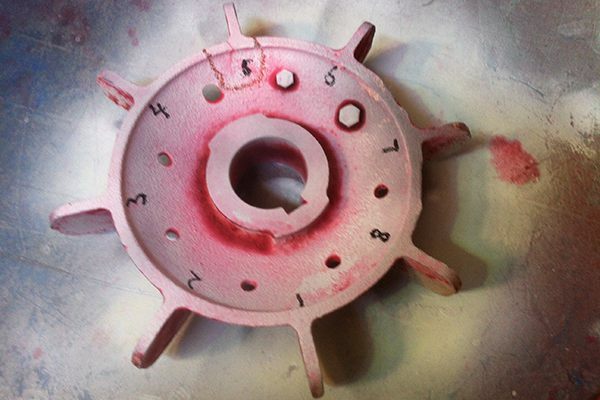 Particles caused by normal wear and operation will mix with the oil. Any externally caused contamination also enters the oil. By identifying and measuring these impurities, you get an indication of the rate of wear and of any excessive contamination. An oil analysis also will suggest methods to reduce accelerated wear and contamination. The typical oil analysis tests for the presence of a number of different materials to determine sources of wear, find dirt and other contamination, and even check for the use of appropriate lubricants. NDT Services Group offers vibration analysis of your rotating assets utilizing modern equipment and highly trained skilled technicians to identify and recommend corrective actions necessary to keep your plant operating at peak performance. Reports list the condition of the plant surveyed in a clear and easy to understand format. Plant requiring corrective actions have a detailed fault analysis and description with required recommendations. Grease and oil sampling, on-site balancing, motor diagnostics, laser alignment and thermography services are offered by NDT to complement vibration analysis programs. Early identification of serious problems is possible. Reports are delivered promptly so identified problems can be actioned prior to costly failures. Need help or advice regarding Vibration Analysis services? A non destructive and non intrusive preventative maintenance tool. Need help or advice regarding Thermal Imaging services? NDT Services Group offers thermography services carried out by qualified electricians with Level 2 or Level 1 certification. With increasing demand to cut costs and remain competitive, many companies are expanding their maintenance programs to include predictive and proactive technologies such as infrared thermography. 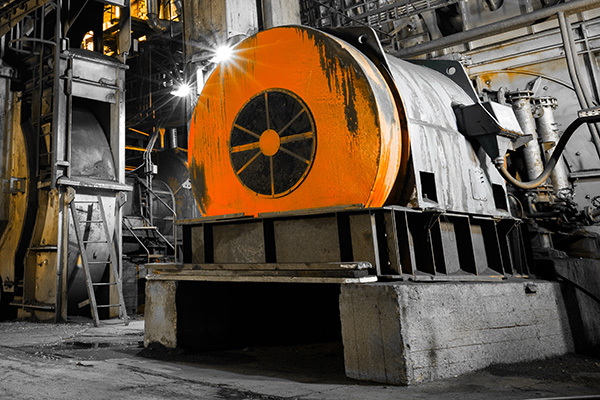 Recent years have seen an increase in the acceptance and use of infrared thermography for preventative and predictive maintenance. While early applications were confined primarily to electrical and structural situations, today's industrial environment has resulted in NDT Services Group constantly finding new and diverse applications for thermal imaging. Detailed full colour reports detailing IR and visual images, fault severity, fault description and recommendations are issued for every survey. These reports are utilised by maintenance personnel to action identified problems and by insurance companies for compliance audits. Infrared scans identifies problems not seen by the human eye. 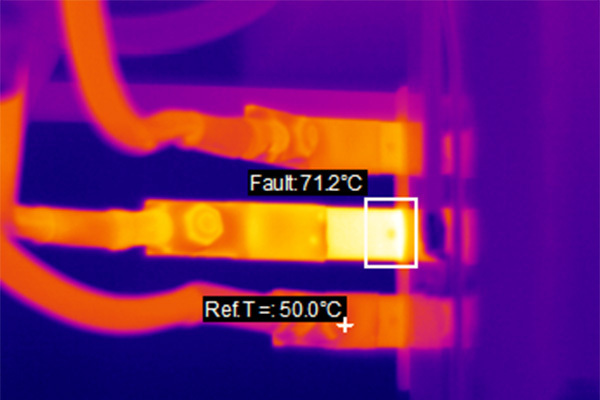 Infrared scans are the fastest way to identify heat generating faults in your facility. NDT Services Group offers laser alignment services that are fast and extremely accurate. Using laser alignment systems, our technicians provide a comprehensive shaft alignment measurement service for your rotating assets. Whether you have complex drive trains, vertical machines, or any number of simple pump and motor sets to align, in standard or hazardous environments, NDT Services Group can provide a cost effective, professional service for your company. The laser alignment systems utilised by NDT Services Group are calibrated to applicable standards which enable both accurate and repeatable measurements. Detailed reports are provided that clearly show, both graphically and numerically, the original and final alignment condition of the drive train components. Plant reliability starts with accurate alignment. When misaligned, the loading of the drive components dramatically increases due to the rotational reaction forces. All alignments have a report documenting before and after measurements. Need help or advice regarding Laser Alignment services? On-site balancing operations allow production to commence immediately after balance correction limiting costly downtime. Need help or advice regarding Dynamic Balancing services? NDT Services Group offers on-site balancing services. We come to your facility and carry out balancing on your assets. 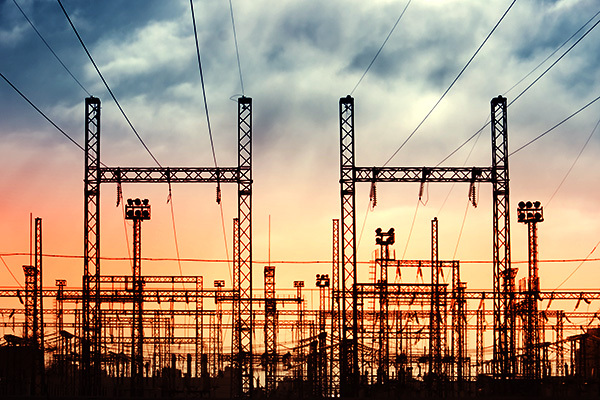 NDT Services Group offers electrical ultrasonic and TEV (transient earth voltage) measurement for identification of potentially dangerous and costly conditions in high voltage systems. With concerns regarding access and arc flash exposure, thermal imaging is becoming increasingly difficult on some high voltage installations. Ultrasonics coupled with TEV measurements allows for non intrusive assessment of high voltage installations in a safe and accurate manner prior to an in service failure. All high voltage assets will have some level of partial discharge occurring either internally or on the surface of the insulation. TEV readings taken, can be quantified to determine the severity of any internal discharge problems and any required investigations or maintenance strategies. 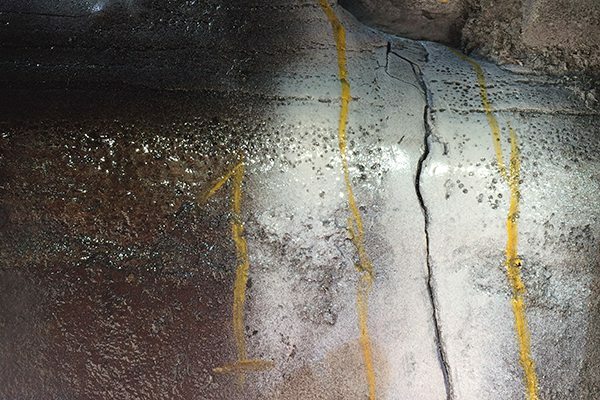 Ultrasonic inspection of the assets allows for easy identification of surface tracking that may lead to erosion of insulation and the deposit of potentially conductive surface contamination. Ultarsonic and TEV detection have become the technology of choice for safe unobtrusive High Voltage electrical inspections. All audits have a detailed report documenting the found state and recommended actions. Need help or advice regarding Ultrasonic testing services? 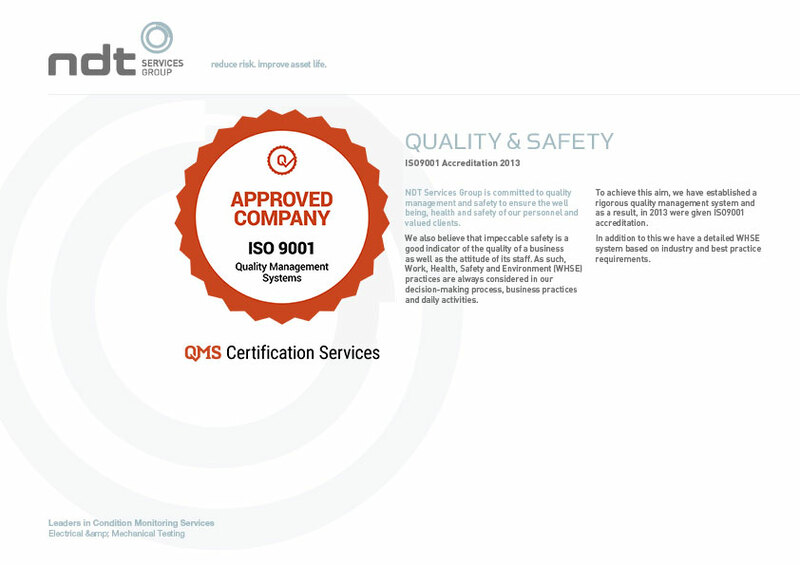 NDT Services Group is a NATA certified company that offers crack testing services, carried out by qualified technicians with AINDT Level 2 certification. At NDT Services Group we recognise that the reliability of Crack Testing depends on repeatability and acceptance levels. When safeguarding structural integrity, our technicians and engineers work together to select the correct NDT method and Australian standard to enable reliable results to be produced. A full colour report detailing visual images, fault severity, fault description and recommendations are issued for every survey. These reports are utilised by maintenance personnel to action identified problems. If required, sample reports for this service offering are available upon request. NDT Services Group is a NATA certified Crack Testing provider. Need help or advice regarding Crack Testing services?